Breast cancer is an issue that has touched so many Canadians, and its cost is both literal and figurative to many families. Which is why the Canadian Breast Cancer Support Fund (CBCSF) has partnered with 11 national beauty companies to launch Causemetics. The all-natural and non-toxic skincare and cosmetics companies have agreed to donate a portion of proceeds (from $4 to $10 as marked on the package) to the CBCSF. 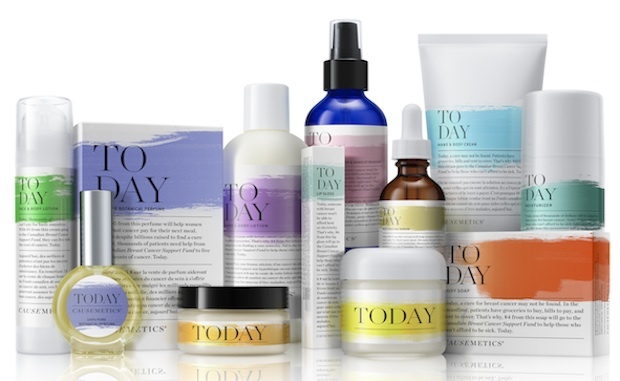 The products are packaged in a universal theme with the word “today” written across the label to signify how quickly proceeds will make their way to women as well as to underline the immediacy of need. “Causemetics emphasizes ‘today’ because despite illness and the inability to work, the rent is due, groceries need to be bought, car payments need to be made, hospital parking needs to be purchased – not someday, today,” Kathleen Collins, VP integrated solutions at Cheil advertising agency, said in a statement. Participating companies and products include Graydon Face & Body Lotion ($29), Evoke Botanical Perfume ($55), Lovefresh Natural Cream Deodorant ($15), Ella’s Botanicals Hand & Body Lotion ($20), Sappho Lip Gloss ($22), Province Apothecary Moisturizing Cleanser & Makeup Remover ($42), Sigrid Naturals Skin Healing Salve ($39), Cocoon Apothecary Moisturizing Serum ($48), Pure + Simple Hand & Body Cream ($49), Consonant Body Soap ($12) and Schaf Moisturizer ($45). Products can be purchased here and at Green Beauty Spa in Toronto starting October 14.